Supertweet: Like a tweet, except much longer than 140 characters, and written as a blog post. As I said when I (re-)started my blog, I might use it for stuff too long to tweet. Supertweets. The first few will be a summary of what’s happened to me over the last week (no, nothing bad). Actually, the last week was mostly uneventful. But a few interesting things did happen. I will start at the, erm, start of last week. 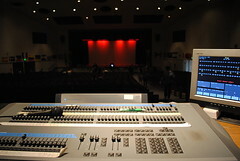 Back on Wednesday (April 6th), I was once again charged, as lighting director on my school’s stage crew, to run lights for a performance called the Brotherhood Assembly, which essentially features the cultural clubs at my school. Although the performances are often neat, it’s not exactly the best assembly of the year, although this year seems to have been particularly bad, not necessarily from a performing standpoint, but from an execution standpoint. The story begins the day before, on Tuesday, April 5th, 2011, after school. So, as usual when I’m running lights, I find myself sitting behind the school’s very own Electronic Theatre Controls Express 48/96 1024-dimmer computerized lighting control system (pictured). About to begin is the second full rehearsal of the performance, meaning that the performers execute everything as if it were the real deal. It’s also the first (and, incidentally, only) tech rehearsal, which means that the stage crew people, such as myself (lighting director) and the audio director (a friend of mine), also observe and prepare for the performance. Tech rehearsals are very important, because it’s when I determine how lighting should work for the performance, when the audio director determines how to set up microphones and cue music, etc. At the start of the rehearsal, we were all given detailed scripts indicating exactly in what order performances were going to be executed, the music to be played (if any, and when to start playing it), and – most importantly to me – the expected lighting conditions for each performance. “Awesome,” I thought to myself, “for once these guys [the Associated Student Body, which was in charge of the performance in general] actually have given us a detailed plan!” Of course, I should have noticed that it was too good to be true, but I was more than ready to accept the script as given to me; I was dead tired that afternoon. So, as the rehearsal ran, I made notes on my copy of the script (as did the audio director) and programmed the necessary lighting conditions into cues, so that during the two performances (more on why there were two later), I would just have to press the <Go> button under Fader A/B on the lightboard to run the show. When I do this, it makes my job a lot easier, and I’m a lot happier. The first thing I noticed at the control desk, though, was the distinct lack of an intercom headset, which is normally worn by me, the audio director, someone backstage, and at the computer/projector at the front of the auditorium. The system allows us to communicate with and cue each other. But the system had been stowed away by the people who ran the school musical a week or so earlier, and we didn’t have the time or energy to pester the right people to get the system back. Oh well, as long as we made sure we had cues down with this rehearsal, all would be fine. We pushed on. At the end of the day, everything was set up. Cues were programmed, both my and the audio director’s copies of the script were filled with annotations, and I was ready to go home and collapse on the couch for a nice nap, expecting that the next morning would be highly enjoyable. Oh, how wrong I was. The next morning, I walk into the auditorium at exactly 7:30 AM, ready to go. I had eaten a nice breakfast, had my coffee, had my heavily annotated copy of the script in hand, and knew exactly what to do. I was promptly handed a new script by an ASB (Associated Student Body) representative. A quick skimming of the new script revealed that the entire performance had essentially been reordered in small ways, but large enough to render my lighting program – and all the annotations I had made the day before – useless. I handed a copy of the new script to the audio director and, after a burst of swearing, we stormed to the back of the auditorium, where the control desk is. However, we were determined to salvage the day, since there was to be one final rehearsal before the performance was put in for real. Although I couldn’t set up new cues due to time constraints, meaning that I would have to run the performance manually, I was able to make some annotations to the new script, which would help me in the performance. The audio director was very confused though, and understandably, for the new script did not include any music cues. Now, the way my school handles these performances is quite weird. They call it a “dual third period”, which, simply put, means that we put on the same performance twice, each attended by one half of the school’s population. We had regained our good mood and composure, and were waiting as the auditorium filled up with students for the first performance, making careful note of the time. We should have started five minutes ago. “Crap.” Oh well, five minutes late isn’t that bad. Then we got the signal from an ASB representative (i.e., she walked out on stage and started to give her little speech), so we began running the show. I dimmed the lights, the clubs were introduced, then I completely turned off the lights for a projected presentation a video made for the performance. I’m not going to go on about the video too much. Summed up, it was filmed with a handheld point-and-shoot digital camera, played on a computer that couldn’t handle it, and the audio – instead of being carried on a line-out cable to a jack on the wall and piped into the sound system, was instead carried to the sound system by placing a microphone next to the laptop’s crappy little speakers (one of the ASB representative’s idea). Suffice it to say that the video was not very well received by the audience. A quick glance at my watch told me what he meant. We were between 20 and 30 minutes over the allotted time. “Oh f***” ran through everyone’s mind, including my own, at that point. At about the same time, one of the ASB people in charge of the performance ran back to the control desk and said something along the lines of “Guys, we need to cut down the performance.” and pointed out a couple of things on the script that were going to be excised from the second performance. Then, a minute later, she came back and changed what was to be removed. No one, myself included, took this very well. Put simply, we can’t effectively do our job if the script is changed every minute. But, it was too late to debate anything; the next group of students began to enter the auditorium. “Oh well,” I said to the rest of the stage crew before sending them back to their posts, “let’s run this as well as we can.” As you might be able to guess, though, it did not go very well. In part due to the lack of intercom headsets, but mostly due to the fickleness of the ASB, nothing went right. We were initially told the video (the same which didn’t go over well at the start of the first performance) would be excluded from the second performance, so I planned the lighting around that. But, as I raised lighting on the stage, I noticed the screen being lowered and the projector being turned on. They were running the video anyway. Well crap. This sort of thing continued for the rest of the second performance. The audio director had an even worse time. He had to execute audio cues completely by guess, since he had no idea which performances were happening and not happening and when to start the music for the ones that were happening. As you can guess, we were very happy to leave the auditorium at the end of the second performance. After the performance, I talked to some of the performers. As you can tell, they were not at all happy about the decision to excise acts from the second performance, no matter what the reason. Many performers broke down when they were told that their act was removed from the second performance due to time constraints, even though they had performed the act for the first performance and had rehearsed for weeks before. One student was even suspended due to his outbreak onstage because an act he was part of was cut. I certainly was not very happy myself at all the last-minute changes being made during the performance nonetheless. Some of this anger was due to the fact that one of the clubs had brought in a violinist – for pay, of course – who had no relationship to the school at all. He wasn’t a former (or current, for that matter) student or even related to a former or current student or faculty member; he just happened to live in the area. This was the first performance that I came out of with a negative experience. Most of the time I thoroughly enjoy running lights for a performance, be it a play, pep rally, musical, or the Brotherhood Assembly (which I had run before in previous years). But I guess this year was an exception, largely due to what I consider to be the incompetence of the school administration on the matter. They knew how long the performance was going to last, but they didn’t do anything with that knowledge, forcing us to excise acts from the performance second time around. Oh well; at least it’ll be the last time I do lights for a Brotherhood Assembly, since I’m graduating in 10 weeks. So this must be what it’s like to work with a politician. Or a group of them, as the case may be.